For over three decades, Ellis Island was the symbol of freedom and a new beginning for more than 12 million people that steamed into New York Harbor and passed through the halls of the immigration inspection station. The facility opened in 1892, taking the place of nearby Castle Garden, which had served as the immigration point of entry since 1855. 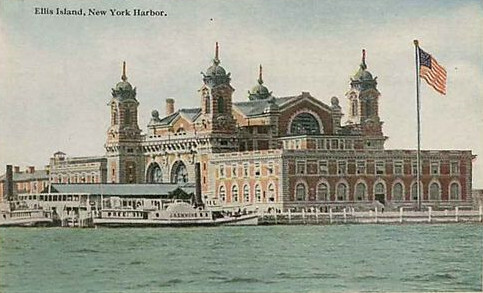 Located just off the coast of New Jersey, Ellis Island is less than a mile from the Statue of Liberty. Passenger manifests for the years 1892 through 1924 are generally in excellent condition and available through EllisIsland.org free of charge -- you just need to create an account. For arrivals prior to 1892, you can search CastleGarden.org, although the records are not as complete or detailed. Your biggest challenge in finding records will be misspellings or records that are incorrectly indexed. Deciphering some of the handwriting can also be a challenge!